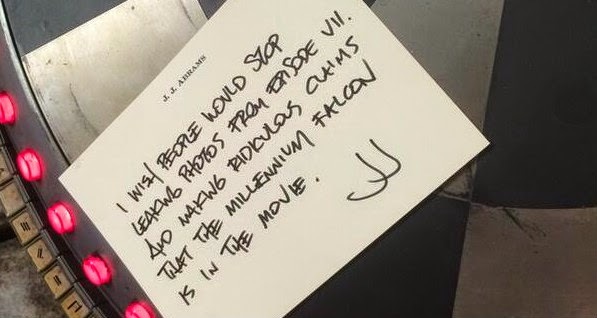 Known for making marketing ploys, JJ Abrams has recently expressed his distaste for the leaking of photos and videos from the upcoming Star Wars Episode VII with a nice bit of playful humor. This is actually kind of hilarious because it could just be to generate more hype about the pictures that really don't show anything. There's also the fact that the note is on something that might be from the film, pointing that this is a big joke. The troll level alert is quite high- as I'm fairly certain that's a Dejarik Table like the one Chewbacca is playing in A New Hope. As for the Millennium Falcon not being in the movie... firstly, the Dejarik Table picture above, and should we even mention the fact that there was a whole lot of JJ Abrams saying that Khan wasn't in Star Trek Into Darkness back before that movie came out, and we all know how that turned out.